BMW is showing off a bunch of new or new-ish technologies this week at the Consumer Electronics Show in Las Vegas. On the just-announced side, there are in-development gesture-based controls — so, thanks to an in-car camera, you may soon be able to draw circles in the air to adjust the volume of your music, or point in a certain way to answer a phone call. Now, I’m not a great driver myself, but I’d imagine that constantly moving your hands around while driving could be a little distracting and dangerous. Apparently that’s one of the reasons why BMW is focused on a fairly limited set of gestures and use cases. 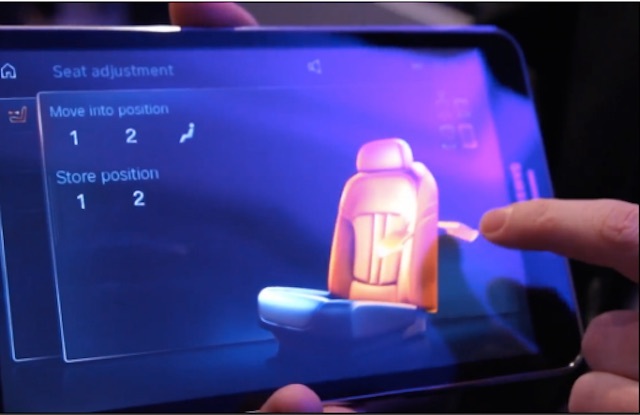 Other demos in the video include a backseat tablet control (also pictured below), a fully automated car-park system, and collision avoidance technology.